This is not a photo from the show, but from a gig about a month ago. However, this is exactly what it looked like, so that's why it's here. Anywho, my friend Nate is playing guitar/keys with M. Ward on his current tour, so he got me and m'lady tickets to see the show at the Aladdin last night, and we had a great time. This was the first of three sold-out nights at the spot on the East end of the Ross Island Bridge, and sort of a short homecoming for Mr. Ward and the group. We showed up around 7:30 (showtime was listed as 8), and were able to get some seats in the center near the back on the floor level. The Aladdin isn't huge, so they ended up being fine spots from which to enjoy the show. It was a diverse crowd: young and old, hip and decidedly not hip. That was nice to see. California group Port O'Brien opened the show, and they seemed happy to be playing in front of a packed house. I didn't really care for their music, but that's not saying much; it just wasn't something there was any chance of me liking. My knee-jerk reaction was to write them off as "too Neil Young-y," and I think I'm sticking with that. For some people, this would probably read as a ringing endorsement. And sure, if you like Neil Young, you would most likely love this band. I don't really care for Neil Young, so, you know, there you go. I'm gonna be honest here: the extent of my M. Ward listening (not counting the She & Him record that we bought about a month ago and doesn't qualify) has been his new LP, which I purchased this past Thursday. I'm sure I heard songs here and there, and definitely have known about him for a few years now, but I never took the plunge. I guess it took one of my oldest friends joining his band to put me into action. I liked the new record (Hold Time) more and more every time I listened to it, so I knew the show would be a fine time. Mostly I was excited about seeing Nate in front of that many people. And it wasn't pitch black. It looked a lot like that picture up there (though that would be one of the brighter moments). So, you could certainly make out what was happening, just not very clearly. Anyway, the show was fantastic. 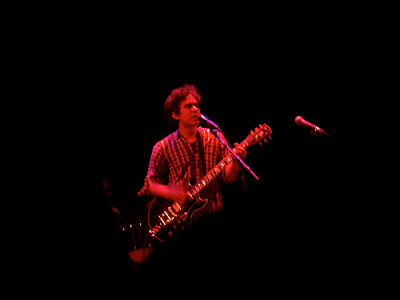 M. Ward came out by himself in the beginning, playing a crazy flurry of acoustic guitar which segued into a handful of proper songs. The band came out, and they ran through another 15 or so songs in what seemed like record time. I don't know if the show was short or if I was just engulfed in the music, but it flew by. They did one encore and called it a night. Everyone seemed satisfied, enough to give them a standing ovation (there are seats in the Aladdin). And I got to see one of my great friends be a part of it all. Really cool. Check out a short video that someone uploaded to YouTube. Yeah, it was really that dark.